Hello Friend, I’m so glad you came to check out this little project of mine! As life got busy I began neglecting my dear blog but I am committed to changing that so you get to see more of all the beautiful people I photograph! 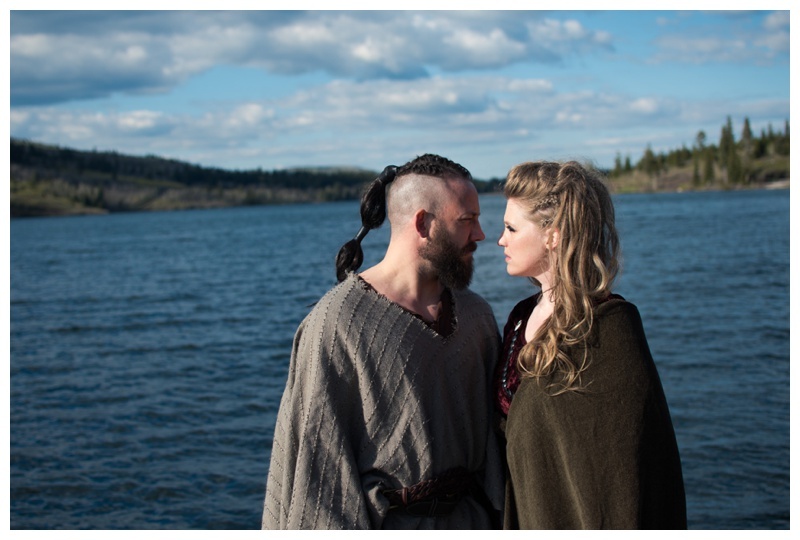 So to kick things off I have a very special photo-shoot to share with you inspired by History Channel’s show Vikings. My hubby and I watch this show because it’s based on real actual history yet they make it so interesting you get completely caught up in it! My favourite character is Lagertha, a strong and independant shield maiden. Luckily, I found her twin, Hope Van de Beek (a local Lethbridge model), and her husband, who graciously let us do this to his head lol. Hope is such a kind and sweet woman! These two also work full time in a prison so they can be just as tough as they look… 😉 I hope you enjoy these photos as much as I enjoyed creating them! Never stop pushing yourself, and trying something new. You won’t regret it! Shout out to my friend Suzi Harder (hairstylist at Shear Persuasion in Lethbridge) for the FANTASTIC job designing the hair for both models. That woman is so talented! Also one more shout out to my friend Sara who helped me with wardrobe styling. Thank You!